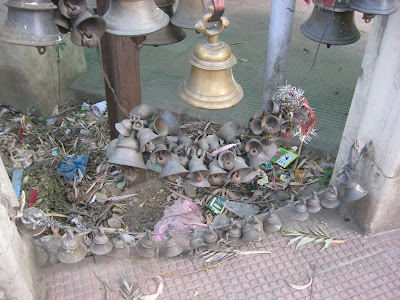 No matter where you go in India, you come across temples. 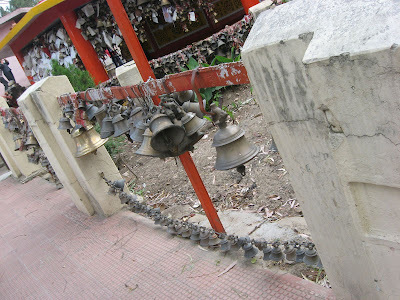 It was the same in Binsar too. Wherever we went, we passed by numerous temples, and often had to take a call on whether to visit it or not. 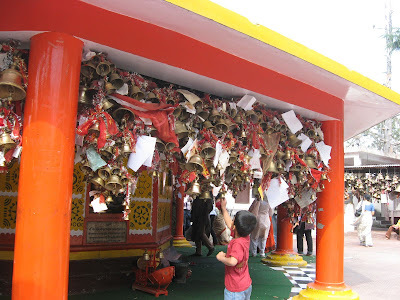 Usually, we are not ones to bypass temples – most of them have something interesting to offer, but this was a trip for relaxation, not just sightseeing or temple visiting, so we decided to visit just a couple of those which looked interesting, and skipped all the others. 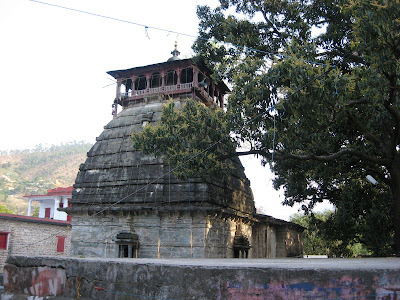 Apart from Jageshwar and Patal Bhuvaneshwar, we visited just two other temples this time. 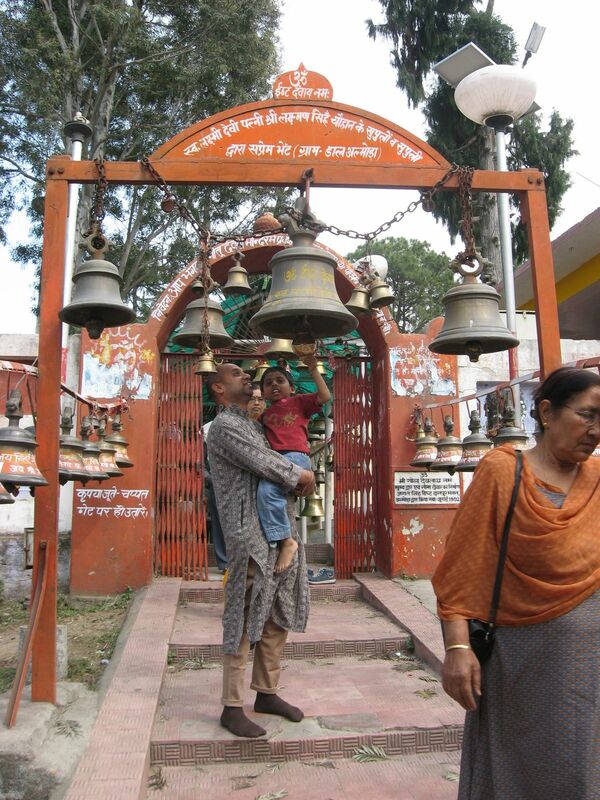 Golu Devta seems to be the local deity of the Almora region, for we passed at least 3 temples dedicated to him, one of them advertising itself as the ‘Pracheen Golu Devta Mandir’ or the ‘ancient’ temple of the deity! Our driver assured us that this was no older than any of the other temples, but simply had some more dedicated devotees, plus its location on a hill top attracted more people for the view. He assured us that he would take us to the most important temple of the deity, and in any case, I was too tired to do any more climbing, so I happily agreed to his suggestion! The temple our driver referred to, was on the way to Jageshwar, and we made a short halt on the way back. From outside, it didn’t look all that impressive, but the most striking thing about the temple is not the temple itself, but the thousands and thousands of bells that hang from every conceivable place in the temple complex! 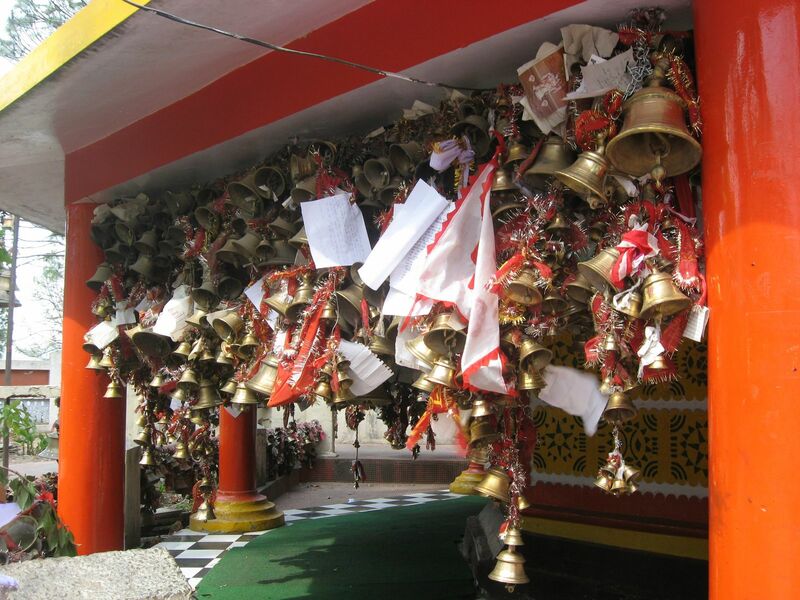 Golu Devta is believed to be an incarnation of Bhairav, and he is depicted riding on a horse. 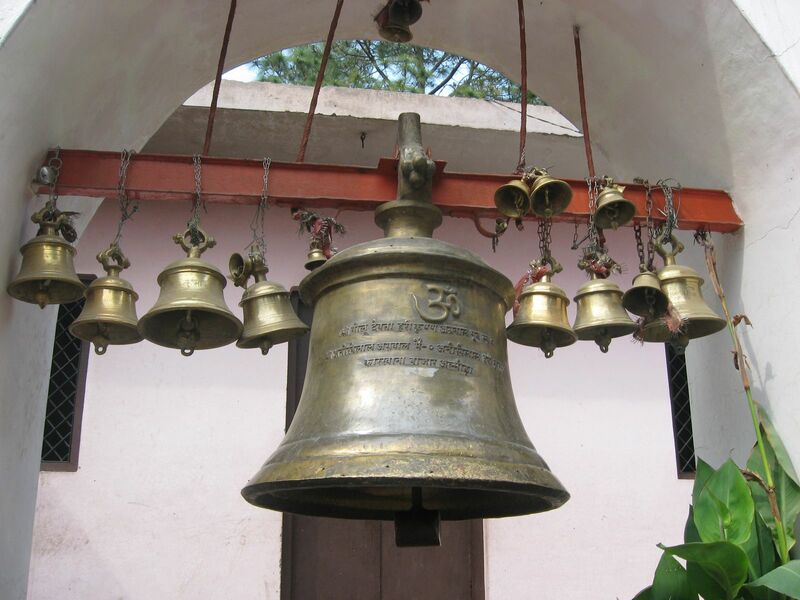 He is believed to answer ones sincere prayers, and all he asks for in return is that a bell be hung in his temple. 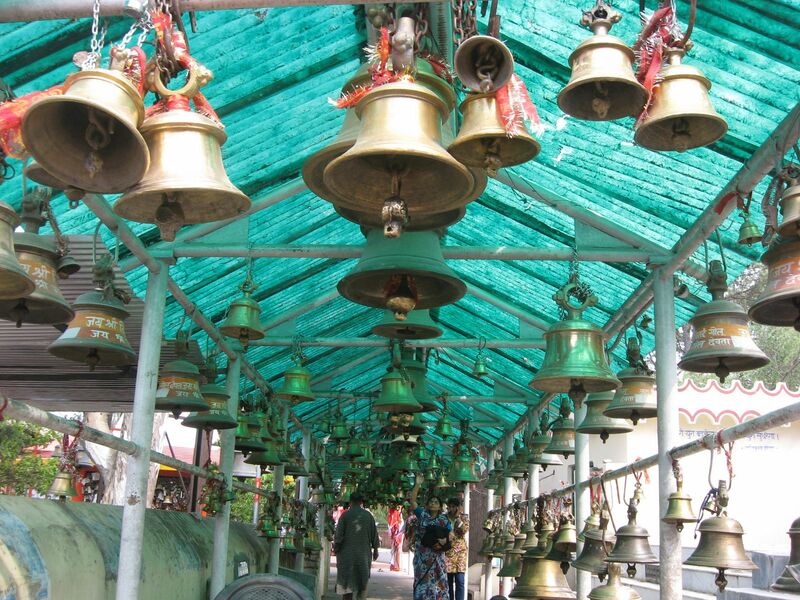 From the number of bells hanging, it is apparent that there are thousands who arrive at the temple with firm faith and devotion. 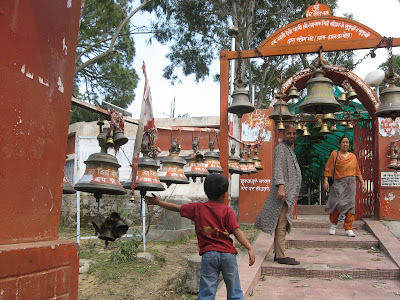 Samhith was fascinated by the temple and the bells, and insisted on running around and ringing as many of them as he could, and we spent more time at the small temple than we had planned. 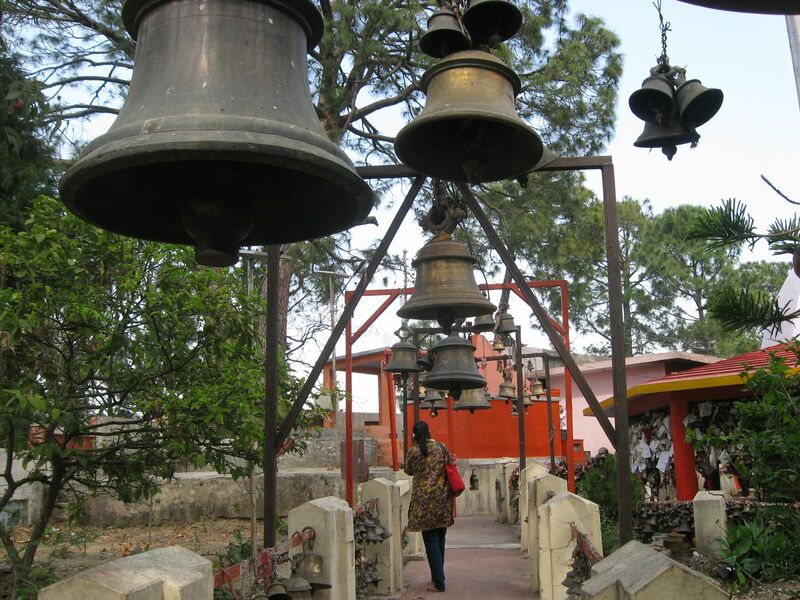 The temple seems to be popular among tourists for the same reason, and Samhith wasn’t the only one fascinated by the bells. People young and old spent just a minute for the lord, and spent the rest of their time photographing the bells or recording them on their camcorders! 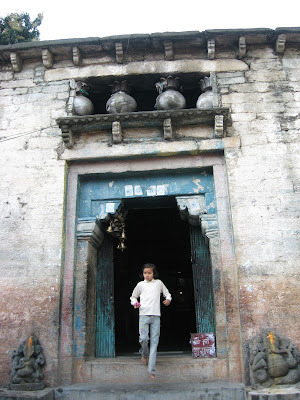 The only other temple we visited was the one at Bageshwar, and that too for the only reason that the nearest ATM was there, and I desperately needed to withdraw cash! 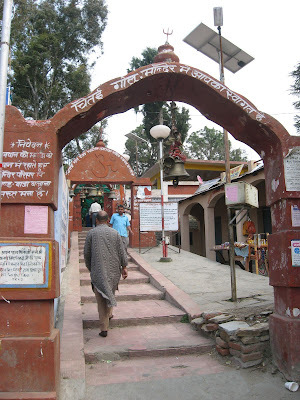 Of course, there was an ATM at Almora too, but the one on our route was not working, and the other was some way away, and we would have needed to take a circuitous route thanks to some one-way restrictions. We thus decided to try out the one at Bageshwar during our return journey from Patal Bhuvaneshwar, even though it meant a detour. Of course, the other reason for visiting the place was that the temple at Bageshwar stands at the confluence of the Sarayu and the Gomti (a local river, not the original Gomti, which flows in UP and Bihar). The route from Patal Bhuvaneshwar to Bageshwar took us through Chaukori, which is also gaining importance as a tourist spot thanks to the scenic view of the Himalayas. We were unfortunate, though, because the clouds obscured all traces of the snow capped hills, and Chaukori did not seem interesting at all! 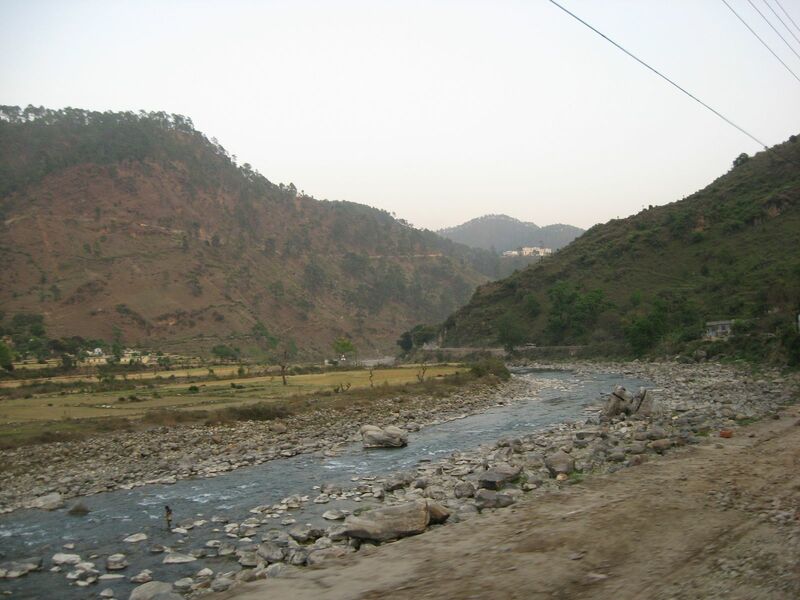 As we approached Bageshwar, we realized why the place had not just one, but two ATMs – it was a huge city nestling in the valley of these huge mountains, fed by the waters of the Sarayu and the Gomti, and looked quite prosperous! Of course, the prosperity came with its own disadvantages – it was terribly crowded, and we learnt that the lack of water in the Sarayu meant that they were suffering an acute water shortage. Indeed, the Sarayu was as dry here as it had been further downstream, and as to the smaller river, the Gomti, it was no more than a gutter! What a pitiful state of affairs! The crowd in the city meant that we had to park our car at the outskirts and walk into the city towards the temple (and of course, the ATM), and we did so, passing the inevitable shops and jostling among the crowds! The temple itself was totally empty, and we were the only ones there! The temple stands right on the banks of both the rivers, and apparently, during the monsoon, the water almost touches the temple walls. 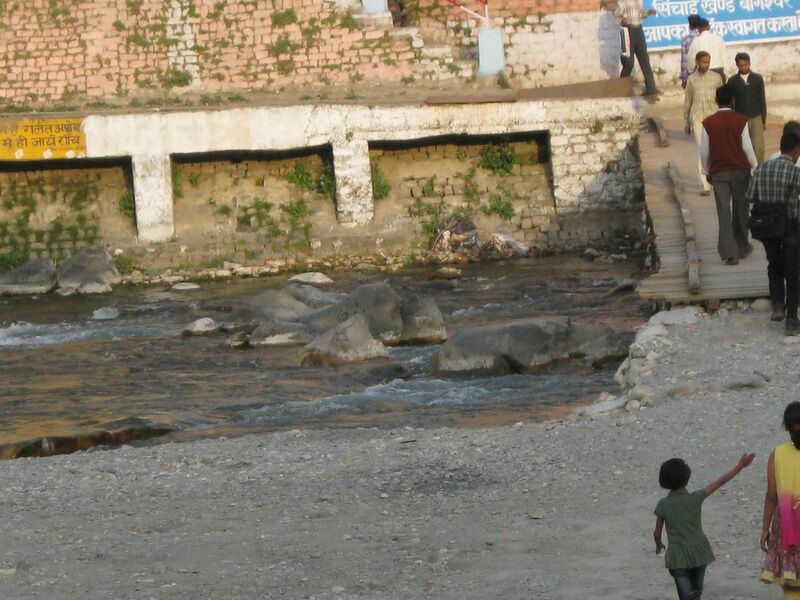 When we visited, the water was nowhere to be seen, and it looked too dirty for me to allow Samhith to go stone-hunting either! Thanks to the lack of crowd and noise, the temple was a peaceful one, and I spent a few moments in the shrine before turning my attention to the surroundings. 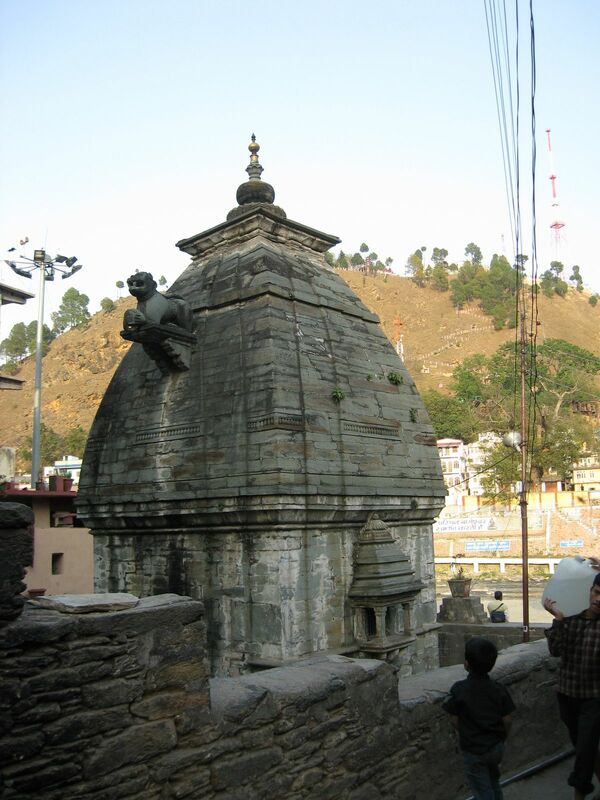 The temple was much like Jageshwar, but without the intricate carvings. However, just outside the shrine were three sculptures which had apparently been found during excavations, and were truly beautiful! The shrine was dark, but even in the soft glow of the oil lamp, the beauty of the idols were clearly seen. Unfortunately, even though the priest allowed me to take photographs, none of them turned out good enough. Maybe the gods didn’t want to be photographed!!! Coming back to the main reason we visited Bageshwar, we managed to find our way to the State Bank ATM, only to find a long queue outside and joined it, resigned to spending at least an hour. A few people entered and exited, and the line inched forward, but then one young man came out to tell us that there was no more cash in the machine!!! Our driver told us that there was one more ATM and we headed towards it, surprised to see that no one else from the queue made a move, in spite of there being no more money in it! Wonder what they were waiting for! As to us, we went on to the PNB ATM, where there was just one soul inside, and as it turned out, he had no idea how to use the card! He had been waiting for someone to come and help him out, but when he saw me, a woman, apparently felt uncomfortable, and exited. When he saw me use the card successfully, he gathered courage and asked me to help him out, so I ended up teaching him how to use his new card! 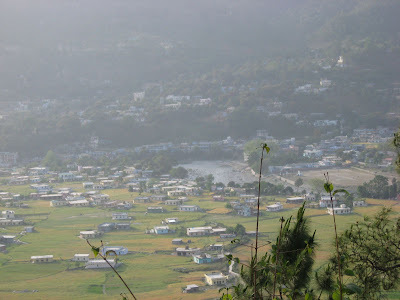 As I left with a smile on my face, I wondered what had drawn me to Bageshwar – was it my need for cash, or was it my karma to help an unknown man learn how to use his new card?????? Food for thought, wouldn’t you say??? 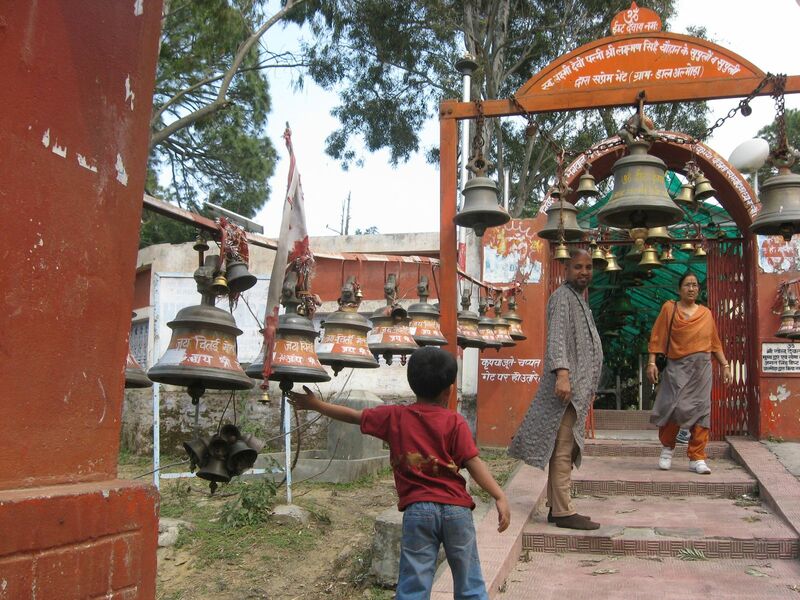 The Chitai temple is just on the outskirts of Almora. 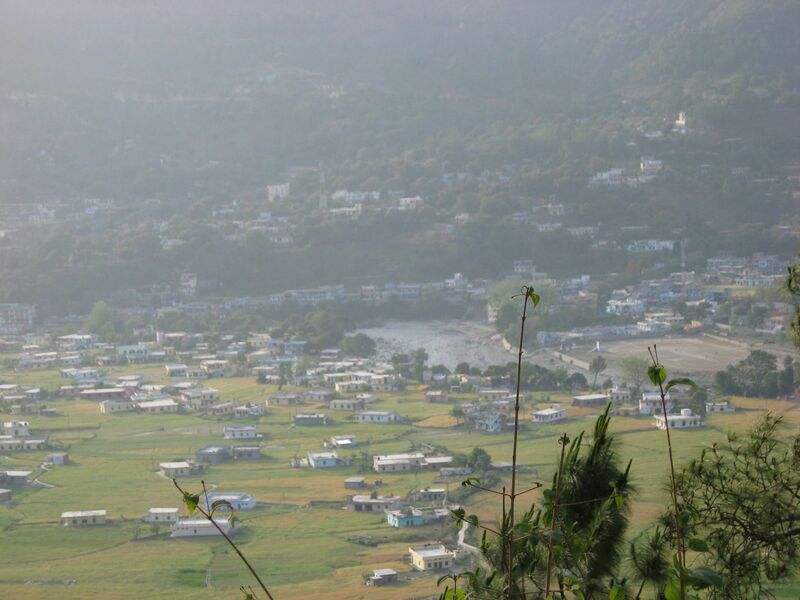 Bageshwar is 180 Kms from Kathgodam and is well connected by buses. The roads are in excellent condition too. I think the papers around the bells are wishes people have left? Sort of letter to God? I like the idea. 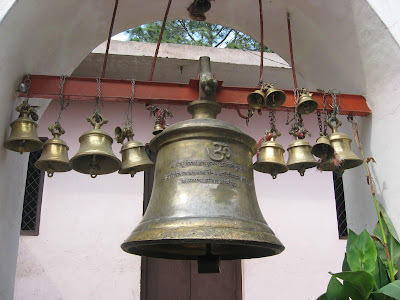 Bells in abundance is a common sight in the hills in N. India but this one had a humongous number! 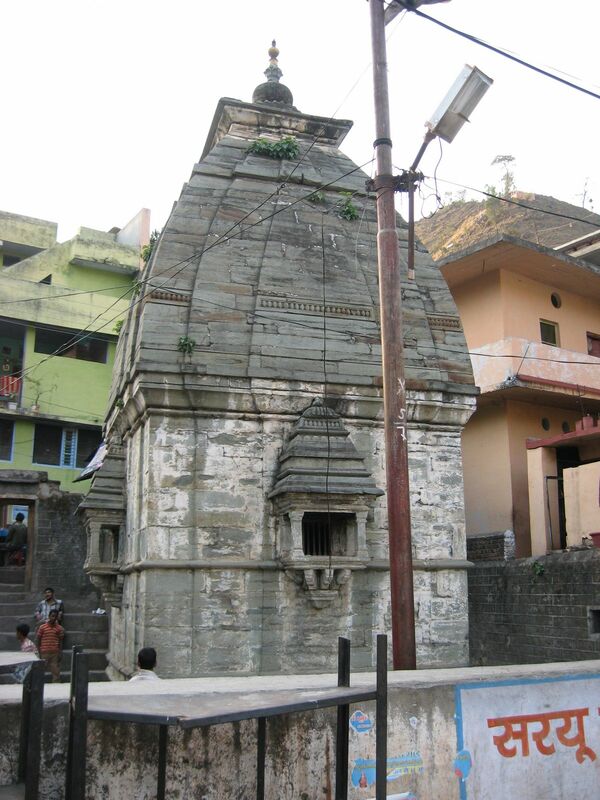 There is an abandoned but beautiful sun temple outside Almora, called Katarmal, I think I told you about it earlier. Also, I want to go to Palithana, heard a very evocative description of the bells and the breeze; have you been there? @Mridula: yes, i think they are....unfortunately there wasnt anyone around to ask... the only priest was busy and everyone around us were busy with their cameras! 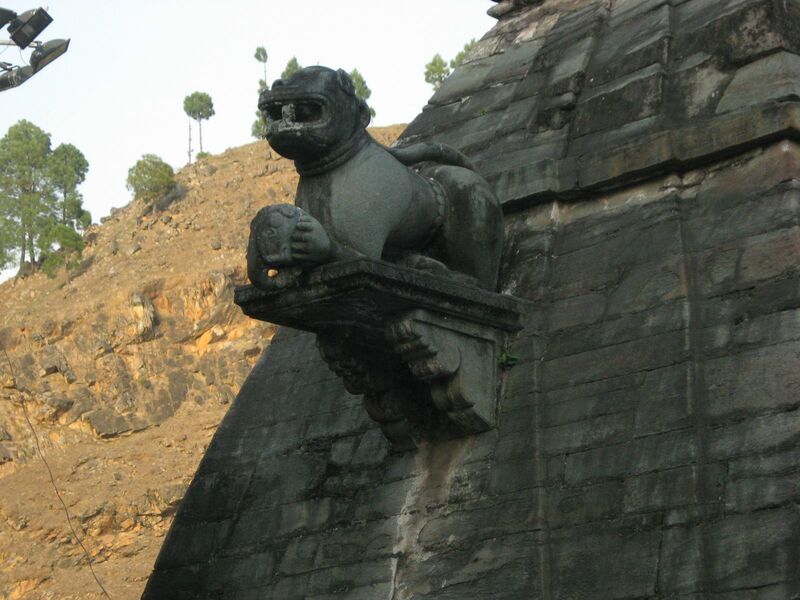 havent been to palitana either.... but have heard a lot!